Brand Identity Essentials, Revised and Expanded outlines and demonstrates basic logo and branding design guidelines and rules through 100 principles. These include the elements of a successful graphic identity, identity programs and brand identity, and all the various strategies and elements involved. A company's identity encompasses far more than just its logo. Identity is crucial to establishing the public's perception of a company, its products, and its effectiveness—and it's the designer's job to envision the brand and create what the public sees. Brand Identity Essentials, a classic design reference now updated and expanded, lays a foundation for brand building, illustrating the construction of strong brands through examples of world-class design. The new, revised edition expands each of the categories, descriptions, and selections of images, and incorporates emergent themes in digital design and delivery that have developed since the book first appeared. Kevin Budelmann and Yang Kim are the founders and co-owners of Peopledesign, a brand strategy and design firm in Grand Rapids, Michigan, helping clients establish strong, future-proof brand identities. Peopledesign has been recognized by ADC Global, AIGA, American Center for Design, American Graphic Design Awards, AR100, CMYK Magazine, Communication Arts, Coupe magazine, Creative Quarterly, Critique Magazine, GD:USA, Graphis, How, Inc. 5000, LogoLounge, Print, ReBrand, STA, Step: Inside Design, Type Directors Club, Webby Awards. 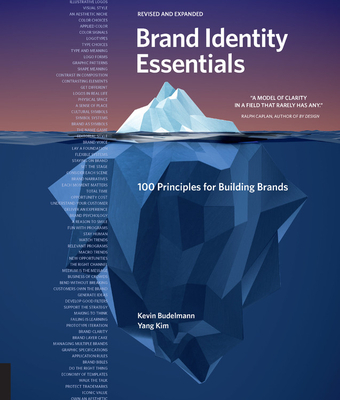 Budelmann and Kim published the original edition of Essential Elements for Brand Identity with Rockport in 2010.